Meteorologists now use satellites and complicated mathematical models to make their forecasts. Tornadoes, however, remain as deadly and unpredictable as ever. To date, the 2011 U.S. season has been one of the deadliest on record; a May 24 storm in Joplin, Mo. killed at least 141 people. Although the modern system of watches and warnings has undoubtedly saved many lives, most people still have little warning before a tornado strikes. Scientists are attacking the forecast problem by improving both the radar systems used to visualize and track storms and the mathematical models used to make predictions. Although the array of radars across the U.S. is more sophisticated than the one used by Fawbush and Miller, they operate in much the same way. A mechanical, rotating dish sends out pulses of radio waves that are reflected or scattered by clouds, raindrops, and hail. The advent of Doppler radar in the 1990s gave meteorologists the ability not only to see current weather conditions, but also to see where the storms likely were heading, and how quickly. Doppler radars also let meteorologists see if the storm is beginning to spin, which dramatically increases the chance a tornado will form. With this knowledge, meteorologists could provide more advance warning to the people in the likely path of the storm. Even the most advanced Doppler radars take nearly five minutes to make a single 360-degree sweep of the sky. This means information about tornado activity can only be updated every five minutes. "In storms that are producing a tornado, things happen very, very quickly," often in a matter of seconds, said Harold Brooks, of the National Severe Storms Laboratory in Norman, Okla. "Five minutes is a long time in the tornado world." One of Brooks' colleagues, David Stensrud, is trying to shorten the sweep time to a minute -- or even less. Instead of a mechanically rotating dish, Stensrud is helping to create a radar system that samples the sky electronically. The flat panels don't need to swivel in order to obtain a clear picture of the entire sky. The panel's electronic sensors have another advantage over current radar dishes: they can focus on particular areas of the sky where tornadoes are more likely to develop and gather data as frequently as every twenty seconds. Stensrud said that in order to increase warning times, "you need to predict the storms before they become severe." By gathering data more frequently, the new radar systems will allow meteorologists to better predict the onset of severe weather. The National Severe Storms Laboratory believes these new radar systems will be ready for government use in about ten years. But meteorologists don't make forecasts based on radar data alone. They also use mathematical models to make their predictions, inputting basic data like humidity, temperature, and wind speed. The equations take this data and, using the laws of physics, show what the weather might look like in a few hours. Meteorologists update their forecast by adding current conditions to their model. Knowledge of climate conditions is rarely complete, and even small amounts of uncertainty can dramatically change a forecast. Incorporating this uncertainty into mathematical models can allow meteorologists to give more weight to the data they know are accurate, said Ross Hoffman, chief scientist at Atmospheric and Environmental Research in Lexington, Mass. Hoffman and colleagues are working to improve a method known as 4-Dimensional Variational Data Assimilation to give scientists more skill at predicting worst-case scenarios, which gives those in the line of the storm more time to prepare and take cover. Tornado forecasting may continue to defy even the most sophisticated radars and mathematical equations. 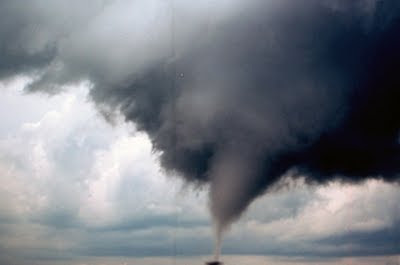 The average tornado forms in a chaotic and fast-changing environment, typically lasting for only a few minutes. It's one thing to predict that conditions are ripe for a tornado. It's quite another to predict when and where a tornado will strike. "Forecasting an actual tornado doesn't seem feasible now," Hoffman said. "But with advances in computing and electronics, who knows how much further we can go."